But Wait, Isn’t Halloween In October? Number four didn’t FEEL like a picture. 75% isn’t bad. Do you remember when you walked into your local retailers a few weeks ago and all you saw was school supplies? Everywhere you looked there were huge signs prompting you to grab your list before everything was gone. Such pressure. I bought my kids stuff weeks before school started. Just so I could rest well at night. Not TWO DAYS after school was back in session I was in the local Kroger grocery store. Now that all of the school supplies were gone, do you know what was on the shelves? All things Halloween. It was everywhere: masks, decor, costumes. Everything was orange, green and purple and exactly why is purple a designated Halloween color, anyway? There were aisles of candy. Every candy known to man. It was apparent that the retailers needed to work me into a frenzy about something new. They had decided on the holiday. I refused. I walked past the aisle without a glance. I was NOT going to be sucked in. I still had plenty of time. Do.Not.Care. Then the first costume catalog came in the mail. My son spotted it. It was too late. Once he realized that it was time for the glorious holiday of plastic costumes and buckets of candy he almost passed out just thinking about the impending sugar high. I told him that we had plenty of time to worry about Halloween. Like in October. I did pretty good too. For a while. I ignored the daily rundowns of what they would be wearing on the big day. Their choices changed constantly thanks to the numerous magazines mailed to my house. I still wasn’t worried. Then it happened. I heard from another mother that Target had a 50 percent off sale on all Halloween costumes. And NOW……I was screwed. I felt sure that I was the only mother on the planet who did not get the memo. I was sure that everyone else’s kid had their costume. Did I mention it wasn’t even October yet? Now it was clear. We had to get to Party City before it was ever lastingly too late. My kids had to have costumes. Stat. We loaded up the car and put her in the wind. I could only hope that there was still time. My kids were so excited. This was their kind of holiday. Creepy character faces and candy debauchery. Woo hoo. We arrive and the kids descended onto that store like they owned the place. They instinctively knew exactly where the costumes were located. Then we saw it. A full wall of pictures of every costume in the universe. We had hit the mother load. You see at Party City, you find the costume that you want by looking at pictures. Then a super helpful staff member goes back into what must be a huge, creepy stockroom to grab your selections. My kids were now standing at the wall of indecision. They tripped over one another as they tried to remain some composure. They had a job to do. They knew that they only had one shot at the perfect costume because we were not coming back to this store again. Until next Halloween. Within two minutes the boys had zeroed in on three Star Wars characters: General Grevious, a Clone and Darth Vader. I could not be more proud. I begged my daughter to go with the Female Darth costume complete with a skirt and Vader mask. Nope. She HAD to be Venus. The Goddess of Love. Okay. If that made her happy. They all tried them on. The boys squealed with delight. Could they wear them home they begged? Of course they could. It was Halloween after all. Except it was September. My daughter however would not be so easy. I could tell by the look on her face that she didn’t love hers. She asked for another try. Round two. She looked at that wall for ten minutes. There were just so many. Finally she zeroed in on a Monster High costume. It came with a green wig. Who doesn’t love a green wig? Let’s try it on. Round three. The boys had been there for so long now that they too had decided that they no longer want their costumes. They all wanted a do-oven. Dad dropped his head in disbelief. Can anything ever just be simple? Poor Dad. One more try for everyone. But I tell them that THIS is it. And I tell my daughter that she is on the verge of dressing up as a 9-year-old girl. All the boys wanted to be a Ninja Turtle. Except only one costume was available in their size. My oldest son grabbed it. The other two decided that they would settle for Power Rangers. Except only one was available in their size. My middle son grabbed it. The baby was devastated. I told him to look again. Their had to be one more that he loved. He finally pointed his tiny finger at Spiderman. Ahhh Spiderman. Everyone loves Spiderman. Except we already had a Spiderman costume at home so I totally tricked him into believing that I bought him one. Later at home I presented him with a brand new (TWO YEAR OLD) costume. He’s four. He bought it hook, line and sinker. What about my daughter you ask? She finally settled on Little Red Riding Hood. Why? Because what she wanted most of all was a hood. And a pair of red shoes. Who doesn’t want ruby-red slippers? Three costumes and all the necessary accessories added up to be a lot more than I wanted to spend. Then I looked at those little, smiling faces and I remembered that all too soon they would be too big for a trip to buy Halloween costume with Mom and Dad. They are growing up way too fast. I cannot wait to take my babies trick or treating. For as many years as they will let me. These are the days when memories are made. I’ve already seen Christmas decorations at several stores! 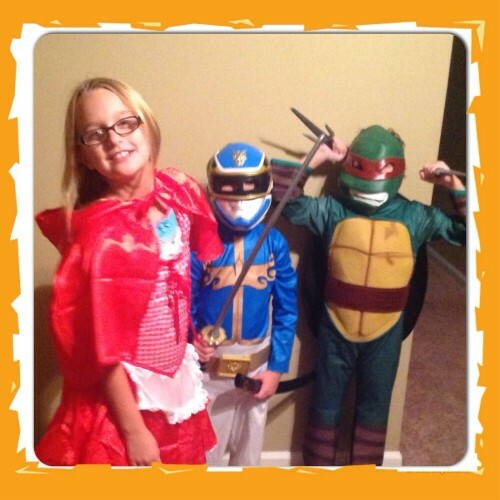 At least your kiddos are excited about Halloween….LD wants to hand out candy…this is not the holiday for him. Hasn’t been for the last couple of years. Not sure why, just isn’t. I even told him that he could get a costume and sit outside and hand out candy….still didn’t work. I’m not sure where he came from! Oh wow. Poor little guy. I guess it’s just not for him. He can always change his mind later. My favorite holiday! Too bad they already have Christmas trees out!!! I will be an undead nurse on Halloween day and then for my BIL’s party I will be one of the killers from You’re Next because scaring children is my favorite thing to do!